Oh man, hahaha. 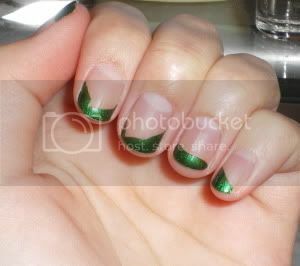 I've just done one thing after another to this poor manicure. First, I accidentally bumped my hand during application so I have a botched ring finger. Then I actually smacked my thumb against my desk so my thumb is all smudged. And then I swiped my other thumb against my sweater right after I put on the top coat and now my right thumb looks furry... Poor, poor mani. Anyhow, X is a very dark burgundy shimmer. As far as I can tell, it's a black jelly polish with red shimmer. This is almost a dupe for Sephora by OPI I'm With Brad. It's just a wee bit lighter if I remember correctly. I like it. I think I might just prefer it to Brad. Edit: And it's a wee bit more on the plum side where Brad is a bit more red. I find the polish a little bit thick, but nothing to really hamper application. Goes on smooth as most jellies do. And cleanup is really easy as it's a jelly. Overall, good polish. 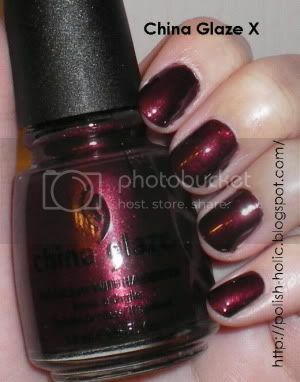 I wish some of the brands such as China Glaze would jump on the wide brush bandwagon though. It makes application so much easier. Trust me when I say my left hand looked better than my right. My left definitely turned out looking like I did it on purpose. My right did not. It's my right I was ashamed of. Hahaha. woo hoo! i got a mention!